I got myBirchbox super early this month but didn’t get a chance to write up a review since I had finals – which are done now so YAY! First semester of grad school is officially over! For those who don’t know, Birchbox is a monthly beauty sampling subscription service that costs $10/month! 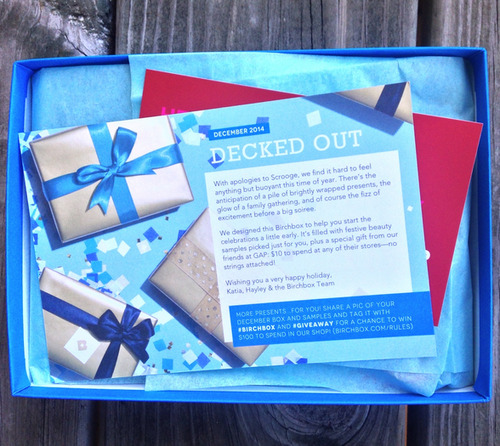 This month’s theme is “Decked Out” and every review I read so far gave such great feedback on the box and I am totally on the same page as them! The box this month is GORGEOUS! It’s probably my favorite box of theirs ever! If you read my past Birchbox reviews you probably know they totally rocked and set my expectations super high, so I wasn’t surprised when I was a little let down with this month’s products. 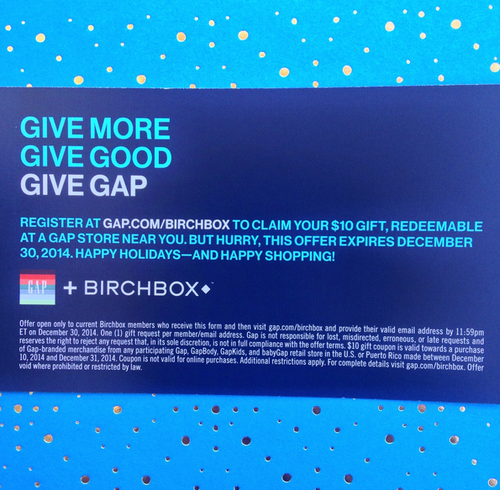 The first thing I saw in my box this month was a $10 gift card to Gap! I don’t shop there so I’ll be passing it along to someone else but I think it’s neat that every subscriber got it! Davines Replumping Duo Shampoo & Conditioner – Bonus Items! Holy moly! I took a double take when I realized I got half of the full sized replumping superactive! It’s pretty much worth the cost of two Birchbox’s! I wasn’t super excited for the product when I looked at my sneak peek online but I’ve seen so many great reviews in the past couple of weeks which got me hyped up for it! This product is supposed leave hair looking thick and shiny – I’m excited for the shiny part but my hair is already so thick, I’m hoping it doesn’t add too much volume! Birchbox sent everyone who got this product a sample duo of the shampoo and conditioner as well! I think that’s pretty neat since I could try the whole set now and get an idea of how awesome the duo might or might now be! SeaRX Microdermabrasion Face and Body Scrub ?? I could not find an amount for the scrub and looking through other reviews – it seemed like everyone had a difference price amount written – anywhere from $2-$5. Anywho – the first item in this photo is the mascara and I feel like I say this often but I don’t use mascaras! No worries though, I’ll be adding this to my cousin’s stocking next week! And another perfume sample!? I don’t like the scent of this so it will probably go to the trash unless I find someone to send it to! I wish there was a way to opt out of perfume samples but sadly, I can’t. The Manna Kadar was the sample choice I picked! I wanted to see why each gloss stain was $24 and honestly – I was not impressed. I tried it and the color wasn’t for me but I also didn’t like the feeling of it and it didn’t last too long on my lips. I definitely prefer Cynthia Rowley Lip Stains and they’re $4 cheaper! My cousin wants to try this so I’ll be giving her the rest of the sample – which is super tiny by the way! I’ve never seen a lippie sample so tiny before! 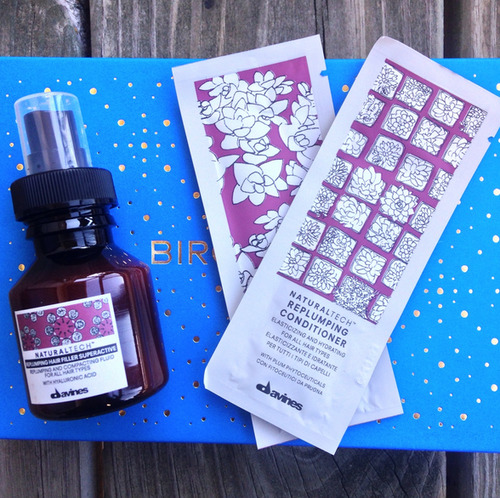 I was excited to see the scrub in my box because I was just telling one of my blogger friends about how I wanted to try a micro-dermabrasion scrub and viola – I got a sample of one in my Birchbox! Overall – the value of this box is a little over $25, without the price of the scrub, so not bad! I’m not super impressed with the contents though – they’re not bad but this box isn’t my favorite considering my past 3 boxes were beyond amazing! I’m glad I’ll be able to give most of the items I don’t like to my cousin so they won’t go to waste! I think what I’m most excited about is the actual box for this month – I can’t get over how pretty it is! Also – I was able to rack up 70 points in the Birchbox store for reviewing all of the products – that’s $7 in store credit! It’s almost as if I paid $3 for this box so I that was another plus! If you’d like to sign up for Birchbox, you can so here! 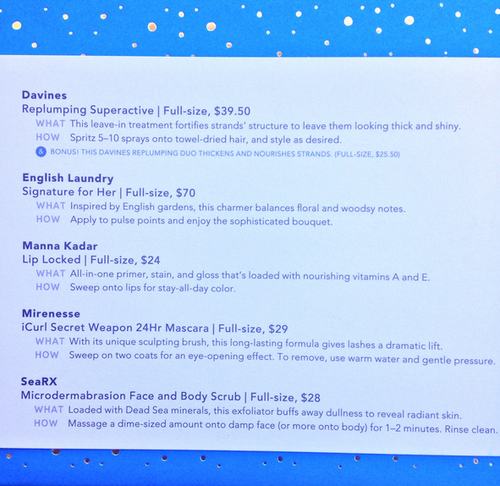 What are your thoughts on December’s Birchbox? Let me know in the comments below, I’d love to hear your thoughts!